This was originally owned by H. C. Snelling and later by Freddy Brown. Kimberly Brown Cavanah writes: My dad bought the store from Mr. Snelling and Mr. H.C. worked with him in the meat department my dad installed. I used to do my homework in the front display windows. I have the best memories of spending time with my grandparents in Pinehurst and then living in their home there after I was married. It is such a beautiful peaceful place. I lived near Pinehurst years ago and it was a thriving town and now the ghosts have moved in. I hate that all small towns are disappearing one by one. We are losing something that was unique. 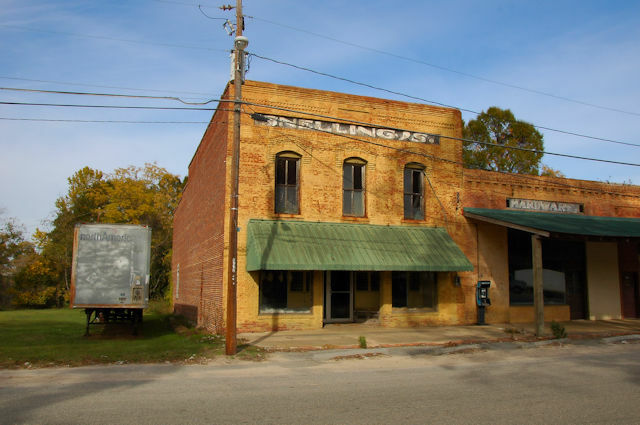 The atmosphere in downtown Pinehurst was indeed “thriving” back in the ’70s when Snellings was a general purpose store selling groceries, clothes, hardware, etc. Reed’s Peanut place was doing alot of business, as well as, Grigg’s Gin, Robert’s general store, & Davis Gun Shop. There was also an ice cream store downtown for a brief while called the “Dairy Dream”. And the Bank of Pinehurst was drawing a few people downtown too. I worked at Dairy Dream and at Snellings back in ’74-’75. Riding through downtown on a Saturday now is nothing like it used to be. Did you work for Freddy Brown?